Existing home sales rebounded from the winter quarter with the highest monthly increase in almost three years, boosting prospects for homebuilders. Existing home sales increased 4.9% in May, although that rally still left existing sales 5.0% below the same period a year ago. The National Association of Realtors (NAR) reported May 2014 total existing home sales at a seasonally adjusted rate of 4.89 million units combined for single-family homes, townhomes, condominiums and co-ops, up from 4.66 million units in April. All four regions increased from the previous month, ranging from an 8.7% increase in the Midwest to 0.9% in the West. All four regions were down from the same period a year ago, ranging from a 0.5% decrease in the South to an 11.4% decrease in the West. Seasonally adjusted condominium and co-op sales remained unchanged both from last month and the same period a year ago. The bad news is that the first-time buyer share dropped to only 27%, down from 29% in April and May 2013. The historical average first-time buyer share is about 40%. Tight lending conditions continue to buffet first-time buyers despite reports of easing standards, and a full recovery awaits their return. Total housing inventory increased 2.2% in May to 2.29 million existing homes. At the current sales rate, the May 2014 inventory represents a 5.6-month supply, down from a 5.7-month supply in April and down from a 6.0-month supply a year ago. NAR also reported that the April median time on market for all homes was 47 days, down from 48 days in April but up from 41 days during the same month a year ago. NAR reported that 41% of homes sold in May were on the market less than a month, unchanged from last month. There were further signs that the market is being embraced by home buyers. The share of distressed sales dropped to 11% in May compared to 18% in May 2013. Distressed sales are defined as foreclosures and short sales sold at deep discounts. All cash sales comprised 32% of May transactions, unchanged from April and down from 33% during the same period a year ago. Individual investors purchased a 16% share in May, down from 18% in April and 18% during the same period a year ago. Some 68% of May investors paid cash, down from 71% last month. The May median sales price for existing homes of all types increased to $213,400 from $201,500 last month and is 5.1% above the May 2013 level. The median condominium/co-op price increased again to $212,300 in May, up from $205,500 in April, and is up 6.6% from May 2013. The Pending Home Sales Index increased 3.2% in March and posted another slight increase in April. Therefore, May existing home sales were expected to increase from the very slow start at the beginning of the year. Higher existing home prices are making homes less appealing for investors. The increased inventory of existing homes coupled with increased new home construction will expand choices for first-time buyers, the missing link in this housing recovery. 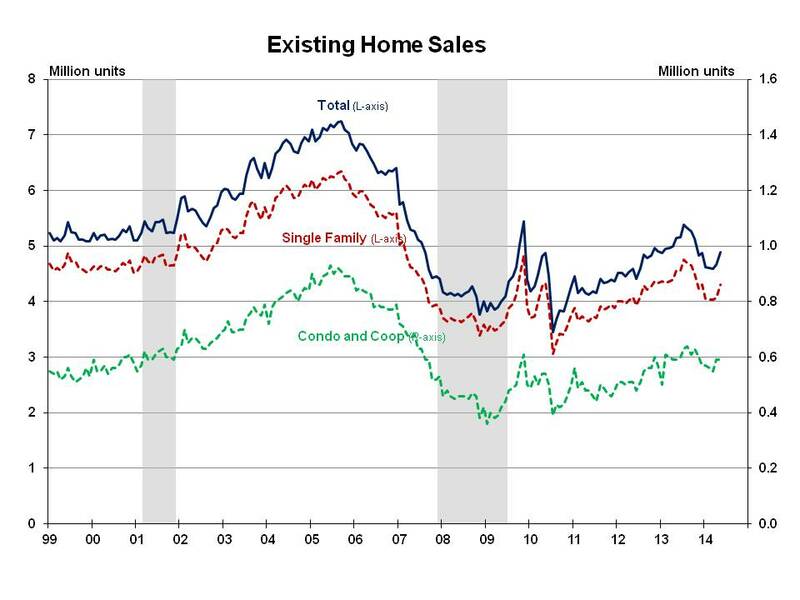 This existing home sales report boosts prospects for homebuilders. May new home sales will be reported tomorrow.